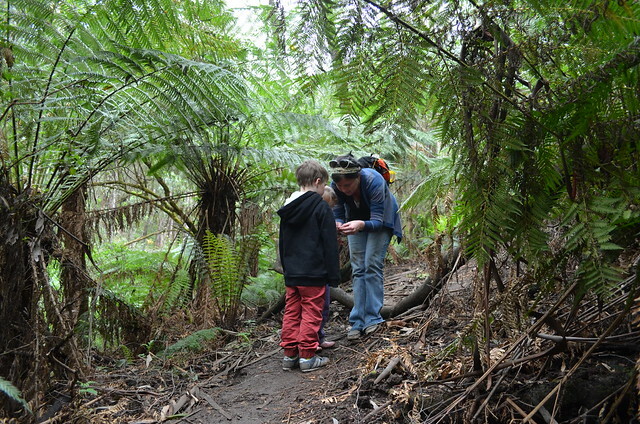 We can theorise all we like about how to hike with kids. The problem is, these things don’t always go as planned. It’s the last day of school holidays and we decide to take The Chop and The Fairy Princess out to Olinda Falls for a hike. They’ve been a bit on the grumpy side but we figure getting them out of the house will be a good thing, so we set off east to the Dandenong Ranges. In the car, the kids ask a million questions about every detail of the trip. How long will it take? 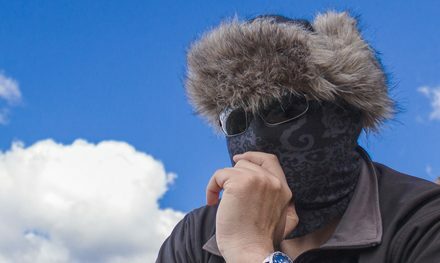 What animals will we see? Why is it called Olinda Falls? They’re excited. We’re excited. When we pull up, I organise The Chop’s latest obsession, “Animal Cards”, so he can bring the ones we might potentially see. We set off down Mechanics Track, chattering about what we’re most likely to come across. It isn’t long before it occurs to me that I may have misjudged the choice of track. It’s been a wet spring so far in Melbourne, and this track follows Olinda Creek. It’s muddy underfoot and recent storms have left the track littered with debris that, in some spots, the kids have to climb over. While The Chop and I are loving it, The Fairy Princess is less enthused. Before long, the whining begins. She’ll barely take a step without one of us holding her hand and for the first half an hour or so, it’s Lori who does so, trying to quell the racket she’s making as we go. Bump trips over her own shadow at the best of times so being tired and grumpy, and on such a difficult trail only makes things worse. She falls over no less than three times in the first kilometre. Her whining seems to get louder and more constant with each fall. Lori’s patience wears thin and we decided to alternate the hand-holding post. In theory, the “Animal Cards” plan might sound like a stroke of genius. Less so when you’re dragging along a four year old who’s screaming like a banshee. Before too long Chop and I have an accidental stroke of luck. We find ourselves well ahead of the others, and catch a glimpse of a Lyrebird as it takes off to escape the noise. The kids are endlessly and passionately curious. Despite the relative lack of wildlife, the temperate rainforest gully offers plenty to capture Chop’s curiosity (and occasionally distract Bump from her turmoil). The things they notice continuously surprise me. They see things that I’d never see. We field questions about seed pods, blackberries, insects. I watch their little faces as they absorb and process every answer. They have the same fascination with hollow trees that I remember having as a kid. Despite Bump’s contempt for all things creepy crawly, I convince her it’s safe to come in for a look. What kid doesn’t love a hollow tree? 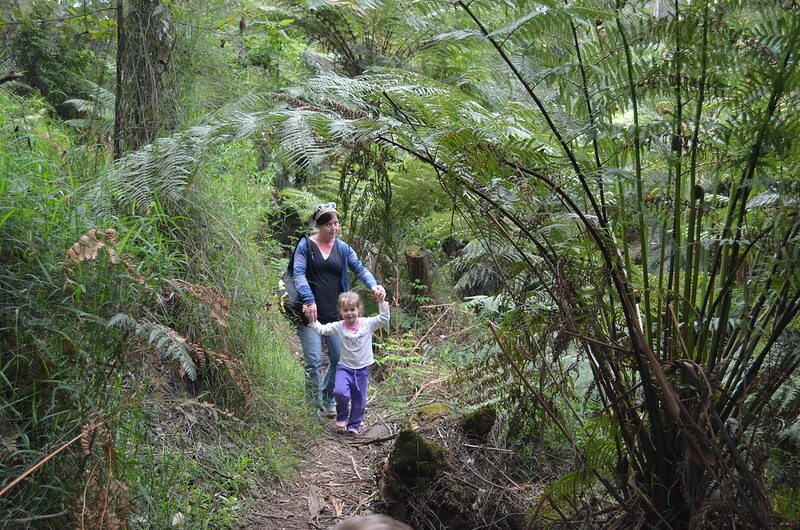 Olinda Falls is the perfect feature for a hike with kids. I don’t think I know anyone, of any age, who doesn’t like waterfalls. Unfortunately, before we arrive at the falls we come to one more realisation… We’ve left the food in the car. Naturally we don’t realise this until the first time Chop says “Mum, I’m hungry. Can I please have some popcorn?”. Bugger. Chop has been very good all day, maintaining a relatively positive attitude despite the commotion his sister has been causing. This is the last straw for him, though. By the time we get to the falls, he is one very unhappy wee man. We do our best to enjoy the tumbling cascades anyway, but our visit is brief. We head back up to Olinda Falls car park, rather than following Mechanics Track back the way we came. With two children now complaining they’re hungry, we decide it’s best that I run to the car and drive back to pick them up. This doesn’t seem like a terrible option to me, all things considered. I embrace the chance to get my heart-rate up, and in the process I interrupt a pair of Lyrebirds who appear to be mating. I’ve never seen a Lyrebird quite so up close and personal before. My day is made. Another shot from the upper viewing platform. Note: Details below are for the return trip that we had originally intended to do. Car Access: Mechanics Track meets the Mount Dandenong Tourist Road at Mount Dandenong Preschool, about 4 km north of Olinda. Parking is available at the preschool and the start of Mechanics Track is clearly signed (as “Mechanics Track – Olinda Falls – 2km”). Further Info: When Mechanics Track is intercepted by dirt roads it continues directly opposite, even though it may not appear that way initially. Had things gone more smoothly, we would have returned to the car exactly the same way we came. 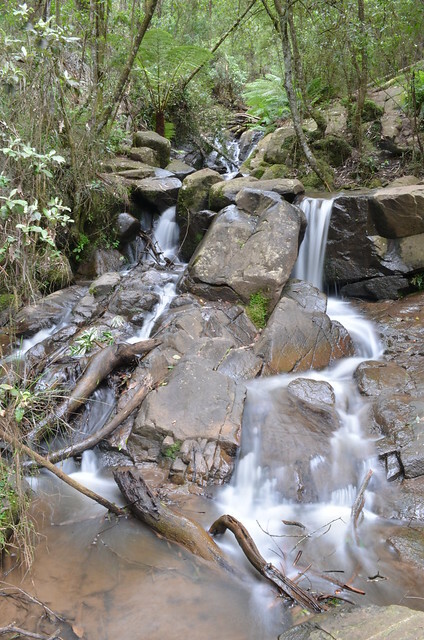 Olinda Falls & Cascade Walk shows another potential way to see Olinda Falls, as well as a different section of the surrounding forest. Mechanics Track is a nicer walk. 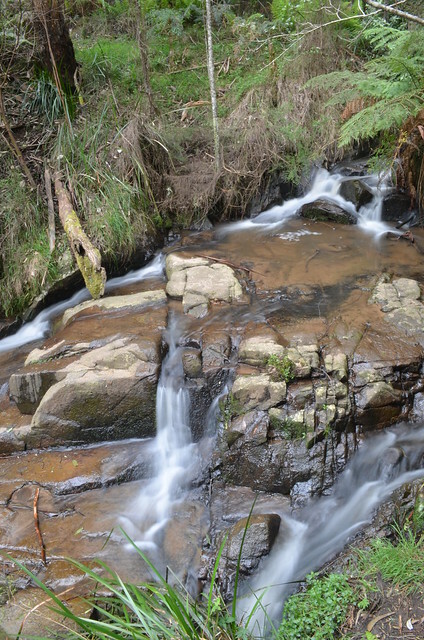 Olinda Falls Circuit is another, much longer option. Unfortunately, one of the tracks mentioned is now closed. An alternative is suggested in the post but I haven’t tried it myself so far (this is a very old post). 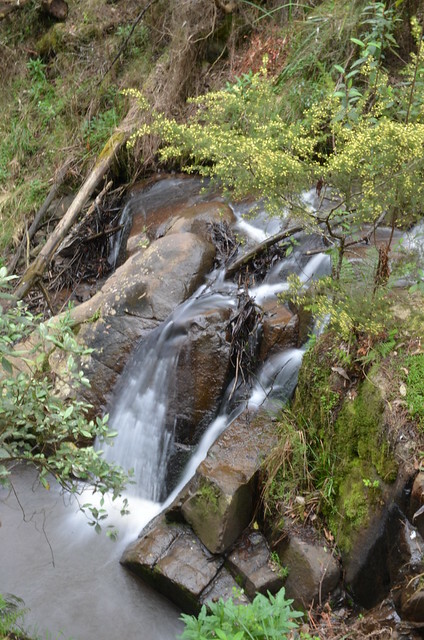 Have you visited Olinda Falls? If you have any stories, updates or corrections, please let us know by commenting below. Did this in the weekend, great track! Although when you meet the road on a few occasions it’s not clear where the track continues…came across a few people who were in the same predicament and they just ended up driving to the Falls lookout haha. 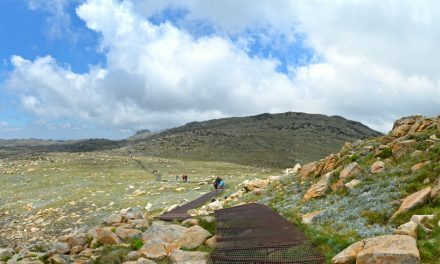 I am always looking for tramping friends in the weekends if anyone yearns to join! 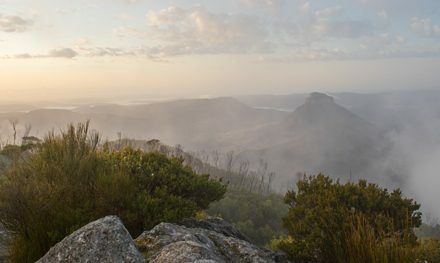 Looking at doing the Cathedral Range this weekend. Thanks for the comment. Those road crossings are a bit unclear at first, unfortunately. Definitely give Cathedral Ranges a go. You’ll love it. My favourite place in the state, for sure. 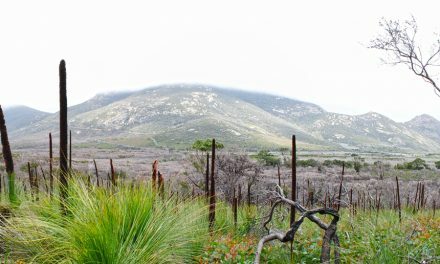 The other place that might be worth trying if you’re looking for folk to go hiking with is the Bushwalk Australia forum (bushwalk.com). 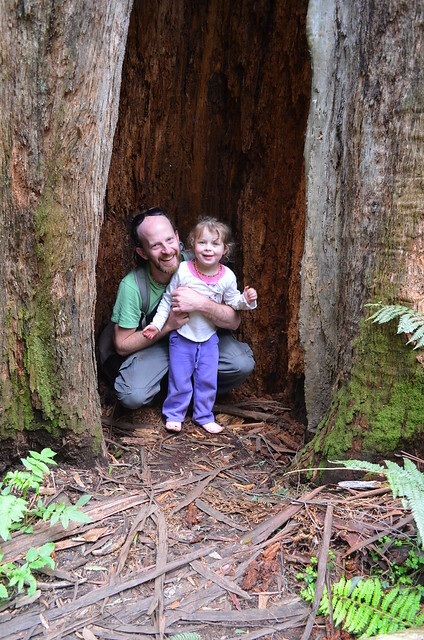 I can remember taking my little granddaughter for a short walk on a trail at Springbrook she wanted to wear her Dora the explorer shoes, they got wedged between a rock and a step. Not a happy ending, she had a melt down! Oh no not Dora! I can only imagine the reaction to that. Bump actually lost one of her shoes in the mud on this particular day but it didn’t rate a mention considering just walking was so much of a drama haha. Bless their little cotton socks! Thanks for the comment, Gillian! Went there for my bday last year with my parents and boyfriend. It’s beautiful, especially for photography in the middle of winter. Probably not so kid friendly though. You should have went to grants picnic ground afterwards. Thats what I originaly did last year and it’s a great way to make everyone happy. Yep, definitely one of the nicer spots in the Dandenongs for photography. Would’ve loved to have gone to Grants so the kids could see some birdlife but we were very ready for home. Bump crashed in the car within a few minutes of sitting down. Thanks for the comment, Jade!